Celebrate a lifetime of enduring happiness with the man of your dreams by presenting him with a ring that represents everlasting love: the eternity band. Most people think of an eternity band as one set with diamonds that encompass the entirety of the band, representing the never ending concept of forever. When we talk about men’s bands, though, eternity doesn’t always mean diamonds or gemstones, but can also signify that the design of the band encompasses the entire ring. While many rings rotate and shift on the finger changing the view of a solitaire stone, eternity bands are infinite in their beauty. No matter how the ring is viewed, the design remains the same. Eternity rings became popular in the 1960s, when jewelers were creating new styles for smaller diamonds. Because men are often active with their hands, the idea that the band can spin or move without affecting the look of the ring has made the eternity style a popular theme in men’s jewelry. Eternally elegant and offering extraordinarily intricate design possibilities, Brilliance’s vast collection of unique wedding bands signify a vow of eternity for the man who has given you the gift of forever. Nothing represents forever better than a meteorite eternity ring forged from genuine space rock that is billions of years old and has traveled more miles than we can comprehend to end up on earth. The meteorite collection of rings offers classic, modern and vintage designs to appeal to every man. All rings in the collection features an inlay of genuine Gibeon Meteorite set in either zirconium, cobalt, or titanium. Named for the town of Gibeon, Namibia, the meteorite features iron-nickel that is estimated to be about four billion years old. 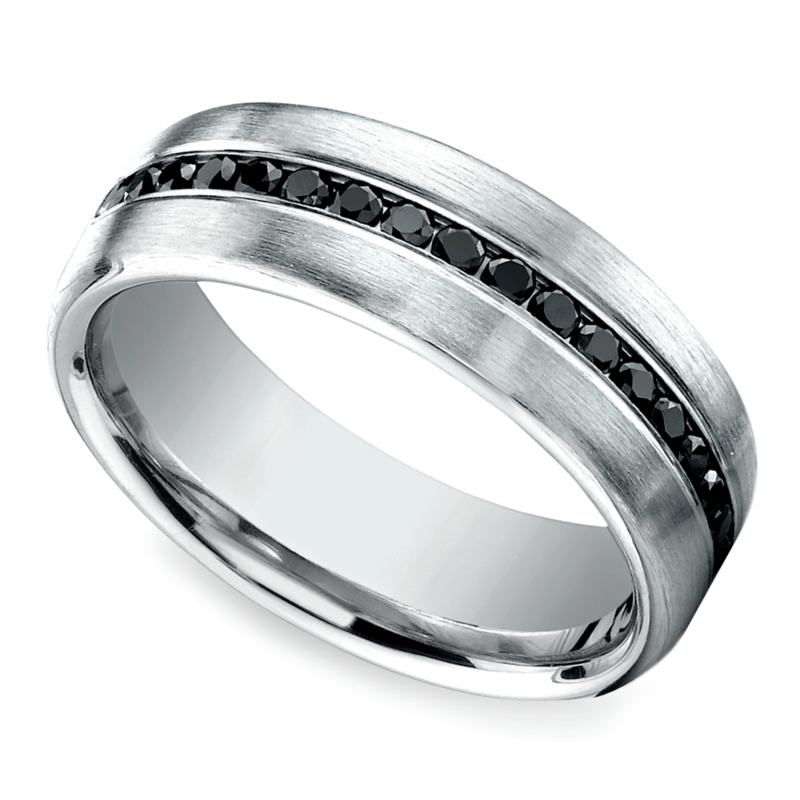 With the Black Diamond Men’s Wedding Ring with Meteorite Inlay, your husband will stand out with a unique design of black diamonds circling his finger. But if the strikingly different look of this black diamond eternity band isn’t a match for your future husband, consider a meteorite ring that has a more classic look. 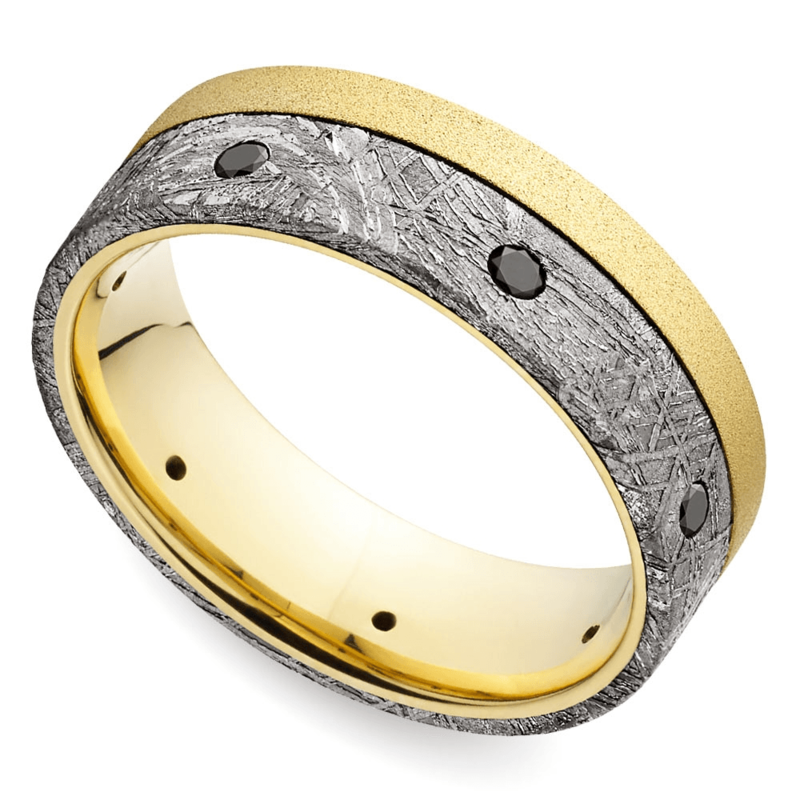 The meteorite inlay in the entire collection encircle the bands, making all of these rings eternity style. Opting for a simple look, like this Comfort Fit Wedding Ring with Meteorite Inlay in Zirconium shows eternal love, but fits better with a more subtle personality. 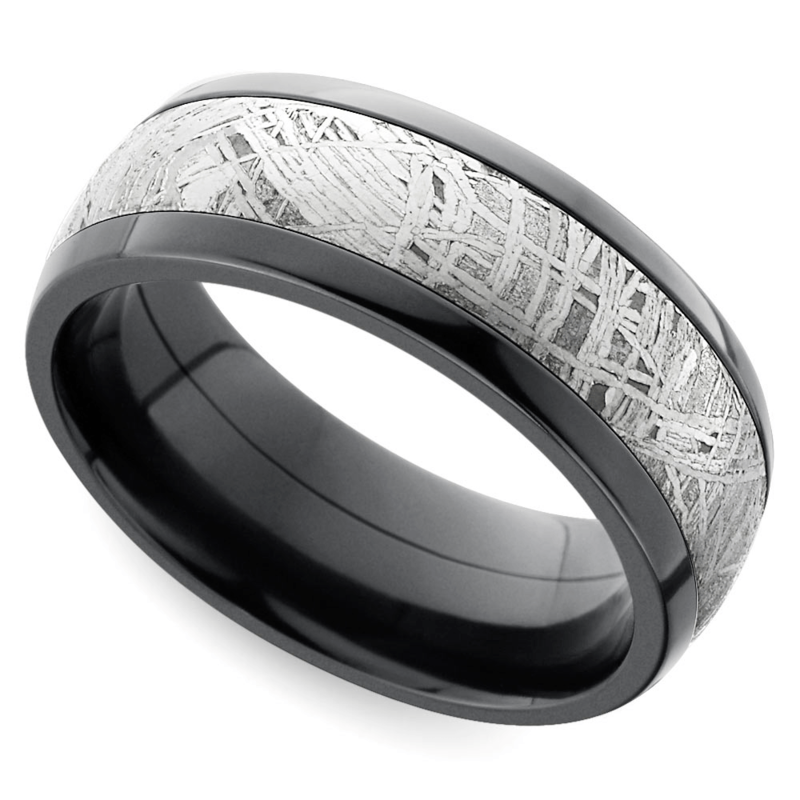 This seven millimeter domed band features a wide inlay of meteorite that offers contrast to the polished, black zirconium base. There are plenty of other options for eternity bands, aside from the meteorite collection. For the man who prefers a classic, yet modern ring design, the diamond eternity ring set in either platinum or gold offers masculine lines combined with a regal elegance. The six-millimeter comfort fit band features 18 round-cut diamonds set in rows of three nestled within a high-polish satin finish. 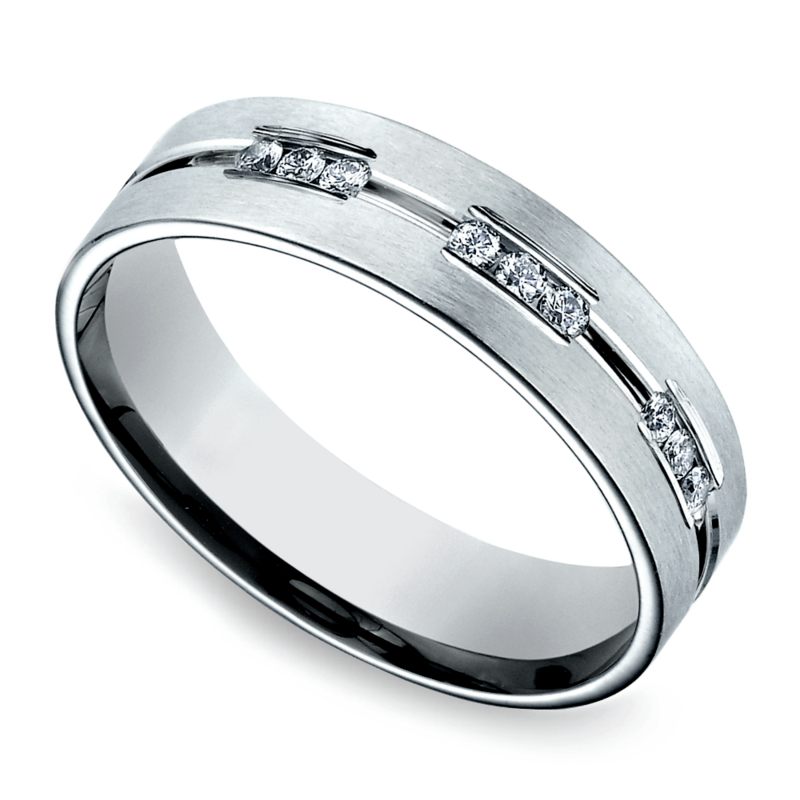 Men opting for subtle diamond detail may also choose a similar eternity design set in palladium, gold or platinum. 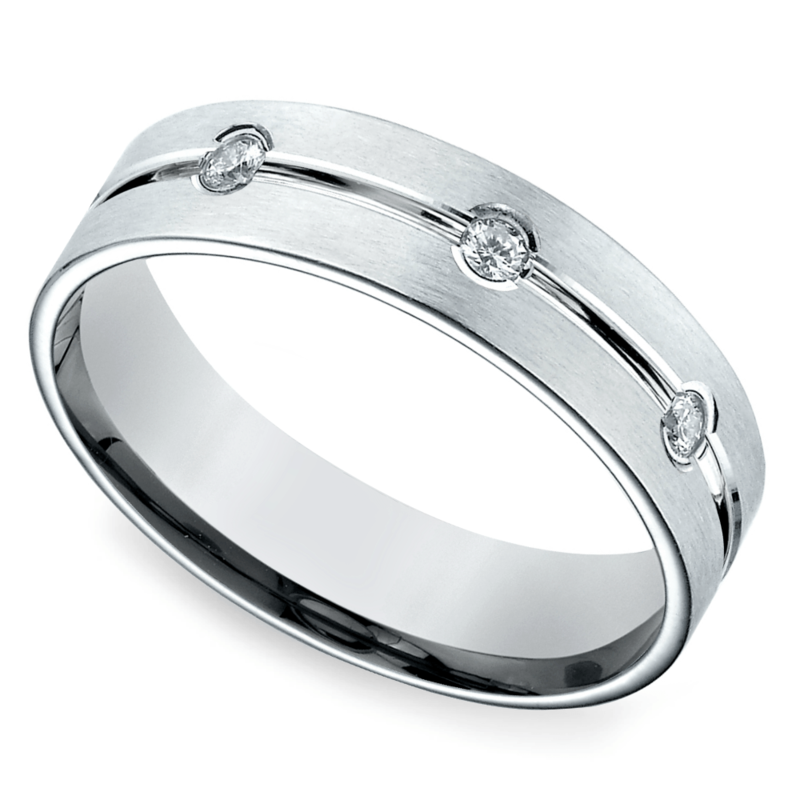 The same high-polish satin finish features eight total round-cut diamonds set in solitaire style around the entire band. Simple and classic details round out the ring without pomp and circumstance. Do you like the edge of black diamonds but want a simpler setting than meteorite? Black diamond eternity bands provide a crisp and modern touch to a classic design. The platinum black diamond eternity band features a solid circle of muted black diamonds creating a streak of color. Brushed metal surrounds the diamonds to create a subtle, yet still stunning look. 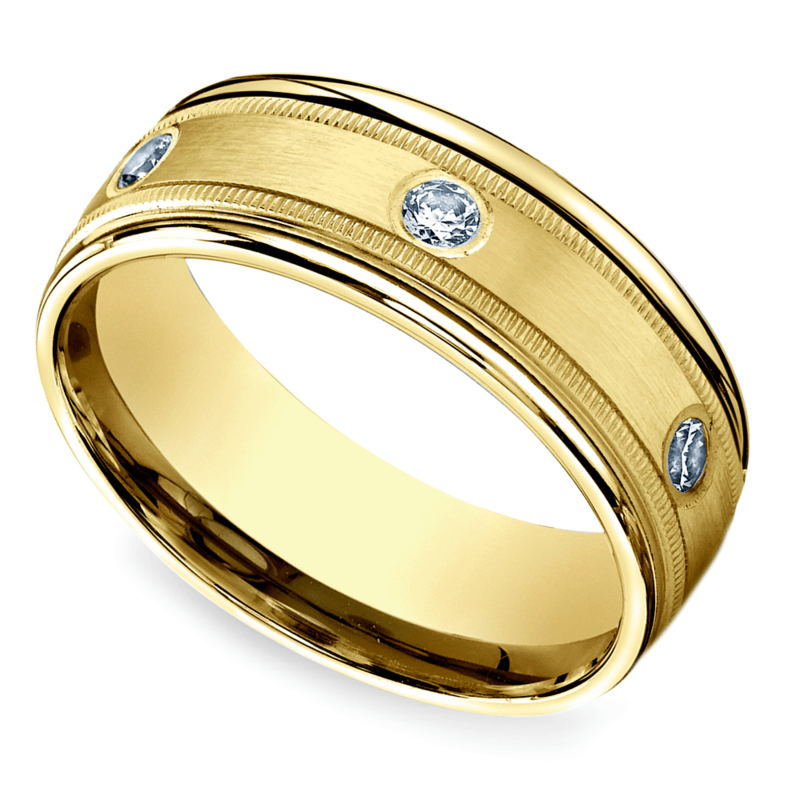 The diamond eternity milgrain wedding band evokes architectural elegance. Set in 14k or 18k white or yellow gold, the eight-millimeter band displays six round cut bezel diamonds perfectly placed around the entirety of ring and accented by bands of high-polished milgrain scrolled designs. 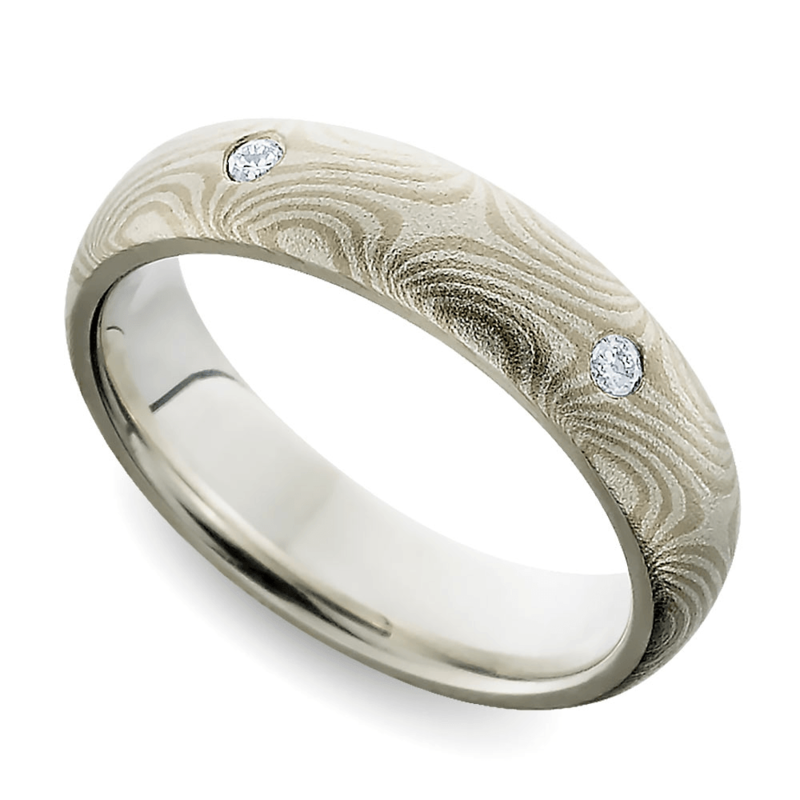 Men who wish to display their unique style will find inspiration in the inset diamond Mokume Gane eternity band. Mokume Gane is a Japanese metalworking process that means “wood grain metal” and creates layers of metals in a design pattern that mimics the graining of a wood finish, with no two rings being exactly the same. This swirling patterned ring features five diamonds totaling 1/6 carat. Eternity bands exchanged between couples should last the entire length of the eternal vows that the rings represent. All rings are backed by Brilliance’s lifetime guarantee. While the promise of the eternity band represents forever, the groom might have doubts about the style of his ring. If he isn’t completely in love with his band, he can exchange it for a ring more suited to his tastes. Brilliance provides a 30-day money back guarantee. Whatever band is chosen to represent an eternity of happiness, Brilliance always has you covered. From free shipping to financing options that meet every budget demand, buying a wedding ring should be a treasured experience. With Brilliance, you can shop with confidence in the comfort of home for the ring that represents a couple’s most wonderful and enduring future.